How Do You Spell Procrastinator? 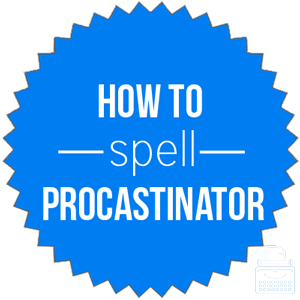 Home » Spelling Dictionary » How Do You Spell Procrastinator? Spelling of procrastinator: procrastinator is spelled p-r-o-c-r-a-s-t-i-n-a-t-o-r. Be careful with the suffix as or and er can be easily confused. Definition of procrastinator: A person who delays important tasks (such as work or chores) by completing minor or more enjoyable tasks instead. Someone who procrastinates his or her work is called a procrastinator. Pronunciation of procrastinator: Procrastinator is pronounced pro-cras-ti-na-ter. The noun procrastinator is often used to criticize a lack of productivity or strong work ethic. Simon, you have been sat at your computer for an hour but haven’t completed any work. You are such a procrastinator! I’m a big procrastinator. When it’s time to complete my homework, I find other tasks to do, such as clean my room or organize my DVDs. Procrastination is a related noun, and it refers to the act of postponing or delaying. While a procrastinator is someone who does the postponing, procrastination is the act, itself, of postponing. Similarly, procrastinate is a related verb. When someone delays his work, he is procrastinating. Procrastinator is a noun used to describe someone who delays the completion of an important task.